If you want to experience a lifetime photography tour, Ladakh is the answer. 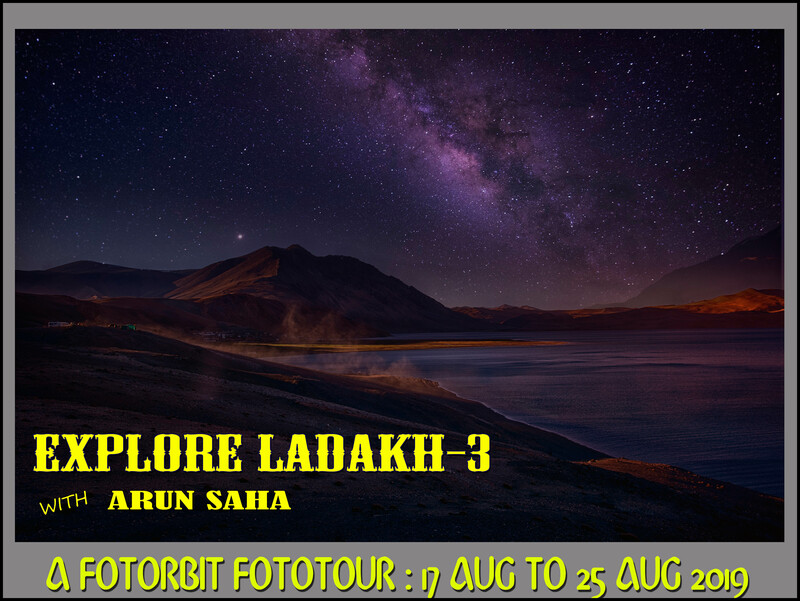 The breath-taking landscapes, beautiful lakes, adventurous high-passes, spectacular monasteries with wonderful people makeLadakhmore than a perfect place to photo-tour…and Ladakh fototour with FOTORBIT makes you to achieve your dream with utmost satisfaction.Our trip itinerary covers the most photogenic places of Ladhak guided by experienced mentors and technical experts of the field. 17 Aug19: Arrival at Leh by afternoon and report at pre-booked hotel. Spend a relaxed day in thehotel for acclimatization. First day is very important for acclimatization. Evening visit to Shanti stupa and nearby Leh market. Today our mentor will arrange your inner line permits for Ladakh. Overnight stay at Leh. 18 Aug 19: Take a drive post breakfast, to pay a visit to the Shey Palace,Hemis Monastery, Thiksey and Sindhu Ghat. In the evening return back to Leh. Enjoy a comfortable overnight stay at Leh. 19 Aug 19: Early morning drive to Nubra Valley via Khardungla pass (Highest motorable road in the World, 18,380 ft).Post lunch, enjoy the camel safari at Sand Dunes between Deskit and Hundur Village on d back drop of serene Deskit monastery. Overnight stay at Hunder. 20 Aug 19 :Early morning drive to Turtuk. Visit picturesque Turtuk village, Indo-Pak border, Shyok river, covering differently beauty of the village people and their lives. Overnight stay at Hunder. 21 Aug19 : After Breakfast, begin your journey for the daywith the visit of Deskit Monastery n then enroutePangong Lake via Khardungla. The sunset is the perfect backdrop you can wish for. Enjoy the beauty of the lake on the bank of Pangong while appreciating the changing colors and fascinating high altitude of the Lake. Enjoy the evening photo shoot at Pangong lake. Today at night we will try milkyway shoot (subject to clear sky) under expert guidance. Overnight stay at Pangong in Hotel. 22 Aug 19 :Wake up early in the morning to witness the mesmerizing beauty of Pangong Lake under the fresh morning rays. Post breakfast set off for a drive back Leh. By late afternoon arrived in Leh. On evening free time for market or take rest. Overnight stay at Leh. 23 Aug 19 : Early morning transfer to Leh airport to board flight back to destination for those who choose for the short tour. Rest will start for Lamayuru Monastery. After Lamayuru, will head towards DAHANU tribal village and stay overnight. 24 Aug 19: Morning shoot in the village and leave for Leh via Sangam. 25 Aug 19 : Early morning transfer to Leh airport to board flight back to destination. Your memorable journey with FOTORBIT to land of dragon concludes here. Cost& Terms: US$ 950 or Rs. 40000/- per pax. For entire tour. All meals (breakfast, lunch and dinner) starting from 17 Aug 2019 lunch upto 25 Aug 2019 breakfast. All local transport as mentioned in the itinerary by Tempo Traveller/Scorpio/Innova/Xylo. Train/flight tickets to and fro Leh. Innerline permits to restricted areas. Pick up and drop to and from Leh airport to hotel. Any personal habits or expenses. Anything that is not in “Inclusion” list. Under any unavoidable circumstances, if we have to cancel our photo tour, your entire booking money will be refunded. Am I eligible for this tour ? Anyone above 18 years (unless accompanied by a parent or guardian) is welcome to join this photo tour. I am new in photography. Will I join this trip ? Yes off course. This tour is for all photography enthusiastic people. The more you travel and explore, your photographic eye will open. Moreover, our Team leaders will ensure to give special attention to the beginners. What equipments are required for this Trip ? Well, even point and shoot camera will work fine. If you have DSLR camera, any medium zoom lens and a wide angle lens will work best. You may also bring portrait lens like 50mm or 85mm prime. Wide angle lens will be helpful to shoot landscape. Tripod will be require for night photography.Laptop with post processing software, external hard drive, and extra memory cards will be helpful. What is the difference between Fotorbit’s Photo Tour and other tours? We are not offering a package tour for general tourists; it is specifically meant for photography enthusiastic people and designed by experienced professional photographers. You will discover the place and learn a lot about this ancient city, local people and their culture which is important part of our travel photography. We will try to observe the local people, their daily activities and cultural beliefs and will try to capture those moments using right compositions and techniques. Our Team Leaders will help our guests to learn camera settings, framing and as well as post processing. 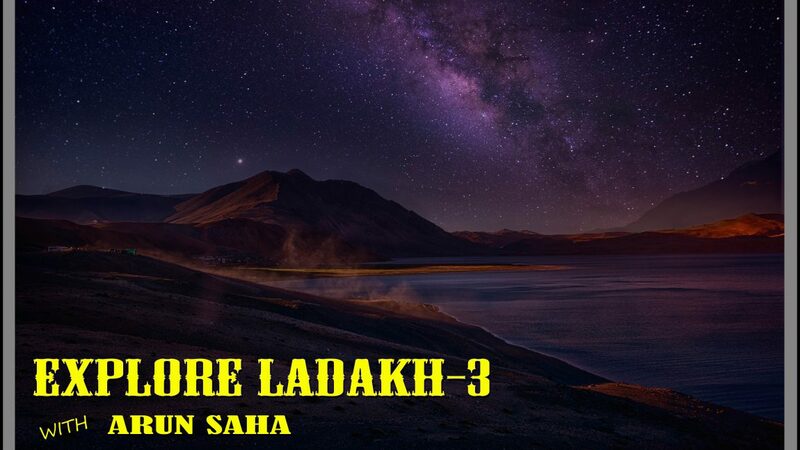 If that’s what is your requirements then surely join us for this exciting Ladakh photo tour with Fotorbit. All itineraries are sample itineraries, intended to give you a general idea of the likely trip schedule. Numerous factors such as weather, road conditions, natural calamities, the physical ability of the participants etc. may dictate itinerary changes either before the tour or while on the trail. We reserve the right to change any schedule in the interest of the trip participants’ safety, comfort & general well being. We shall not be responsible for any personal loss, injury or damage to person, property, or otherwise in connection with any accommodation, transportation or other services, resulting – directly or indirectly – from any act of GOD, dangers, fire, accident, breakdown in machinery or equipment, breakdown of transport, wars, civil disturbances, strikes, riots, thefts, pilferages, epidemics, medical or custom department regulations, defaults, or any other causes beyond our control. Arun Saha, the co-owner and co-founder of FOTORBIT, has worked successfully for 16 years in the field of Cine, Aerial and ground photography with Indian Air Force as a combatant member of photography. He also is the co founder of the international photography club FOTORBIT INDIA. His academic qualification is adorned with Master Degree in both English Literature and Journalism & Mass Communication along with the professional Diploma in Photography. He has been awarded with many national and international gold medals which includes PSA(Photographic Soceity of America), FIAP(Fédération Internationale de l'Art Photographique, Paris), IUP(International Union of Photographers, China), RPS(Royal Photographic Society, Great Britain) and FIP(Federation of Indian Photography). His photographic works have been exhibited in more than 25 different countries worldwide. He has been conferred with international distinction AFIAP( "Artist FIAP") by FIAP, Paris and FFIP(Fellow of FIP, India). Now he works for FOTORBIT as a photographic mentor to the various national and international photographers. Portrait,Travel and Journalism photography is his forte.